On March 21st, Comet 252P/LINEAR will make a close approach to Earth–only 0.036 AU (5.4 million km) away. This is the fifth closest cometary approach on record and, as a result, the normally dim comet has become an easy target for backyard telescopes. Indeed, it is brightening much faster than expected. 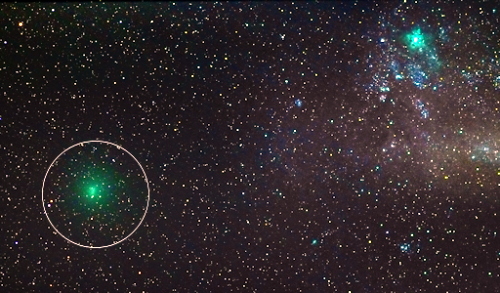 “Comet 252P/LINEAR has surpassed expectations and is now bordering on naked eye visibility for southern observers,” reports Michael Mattiazzo of Swan Hill, Australia. “At the moment it is near magnitude +6,” Observing from Brisbane, Australia, Tom Harradine didn’t even need a telescope to photograph 252P/LINEAR. On March 17th, he caught the green comet (circled) passing by the Tarantula Nebula using just a digital camera. The comet is green because its vaporizing nucleus emits diatomic carbon, C2, a gas which glows green in the near-vacuum of space. The verdant color will become more intense in the nights ahead as 252P/LINEAR approaches Earth. In recent days, astronomers have realized that Comet 252P/LINEAR might have a companion. A smaller and much dimmer comet named “P/2016 BA14” will buzz Earth even closer than 252P/LINEAR on March 22nd. P/2016 BA14 appears to be a fragment of 252P/LINEAR. Unlike its parent, however, P/2016 BA14 is “pitifully faint” and difficult to observe. Sky and Telescope has the full story. There is a chance that the comet’s approach could cause a minor meteor shower. According to the International Meteor Organization, “[modeling by forecaster] Mikhail Maslov indicates that there might be a weak episode of faint, very slow meteors (15.5 km/s) on March 28–30 from a radiant near the star μ Leporis.” Little is known about meteors from this comet, so estimates of the meteor rate are very uncertain. Maslov’s models suggest no more than 5 to 10 per hour.